If you thought Monet, Renoir and co had the whole ‘sunshine on canvas’ thing sewn up, then grab your shades and get yourself to the RA where, thanks to this sparkling survey of US painter Richard Diebenkorn, a warm Californian breeze wafts through the Sackler Galleries. Considered a modern master in the States, with auction prices to match, Diebenkorn (1922-93) is barely known outside of art circles over here. That’s partly down to geography – West Coast artists traditionally have a harder time exporting their talents than their East Coast counterparts. Partly to history – he’s of the difficult-to-place generation between abstract expressionism and pop. It’s also has a bit to do with biography – despite an ever-present ciggie on the go, Diebenkorn lived a life of almost monastic dedication to art. But it has nothing to do with his work. 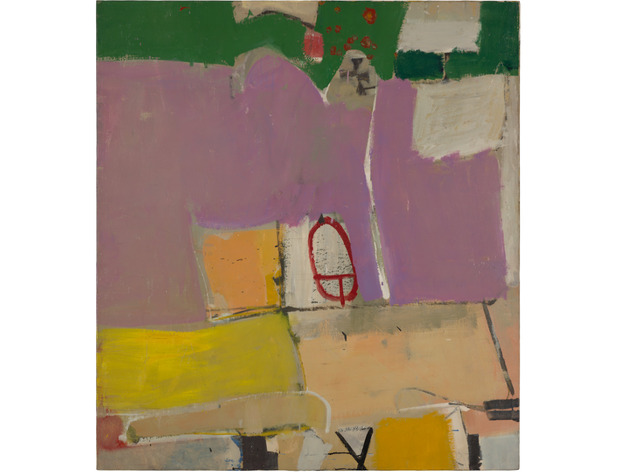 What’s clear throughout this three-room survey is that, first and foremost, Diebenkorn is a great visual seducer. He just has one of those touches that makes you believe in everything he paints – be it a pair of scissors, a half-open window offering an oblique view of a garden, or a series of verticals and horizontals that read like a simplified landscape. 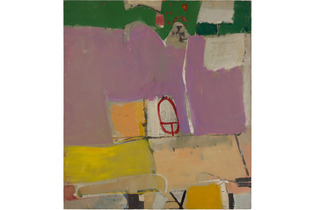 The first part of the show is taken up with Diebenkorn’s initial experiments with abstraction. From student work like the jokey abstract expressionism of ‘Disintegrating Pig’ (1950) he becomes adept at painting interlocking, jigsaw puzzle-like compositions that look partly like exhilarating aerial views but also feel internalised, elemental, like shifting tectonic plates of colour and form. Even as the lines become more elegant and sophisticated you sense a man challenging his own abilities, stopping just before virtuosity takes over. Sensing there was ‘something missing’, in the mid-1950s Diebenkorn took up life drawing, gradually finding subjects – nudes, figures reading, dark interiors, everyday still lifes, suburban landscapes to fill the void. These paintings from the mid-1950s to mid-1960s come across like the missing link between Matisse’s flattened-out forms and the sharp-edged shadow worlds of Edward Hopper. They’re fantastically intense. Diebenkorn was fascinated by polarities, between what he described as ‘representation at one end of the stick and abstraction at the other’. ‘I’ve found myself all over that stick,’ he said towards the end of his career, and you see him sliding towards abstraction again in the final triumphant room. Between 1967 and 1988 he made 145 paintings and 500 works on paper in the ‘Ocean Park’ series, named after the area of Santa Monica where he set up home. The RA has brought together five of the larger paintings. These monumental canvases are as much about subtraction as they are addition. Restricting himself to horizontal, vertical and diagonal lines and layered planes of often pastel colour, Diebenkorn distilled a life of looking, feeling and thinking into an evolving framework, where architecture and landscape, inside and outside, are united by soft Pacific light. Often there’s not much to see at all, but there’s nothing missing in these gorgeously pared-back paintings, either. They lift the spirits as surely as a first glimpse of the sea.